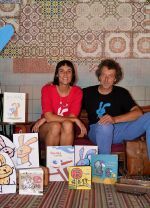 Olalla González Maestra is a storyteller and specialist in encouraging reading. In addition to collaborating with KALANDRAKA, she has coordinated Lobocoxo's childrens space. She has adapted the traditional stories "Garbancito" (Little Bean) and Chivos chivones" (Annoying Goats; KALANDRAKA). Marc Taegar studied graphic design in Barcelona. Currently living in Galicia, he works as an illustrator and designer. Animation, painting, sculpture and graphic art are specialist areas of his work, which has been exhibited in Luxembourg, Germany, China, Spain, France and Costa Rica. He was awarded the 2005 Premio Daniel Gil for his illustration and design work in "La verdadera historia de Caperucita (The True Story of Little Red Riding Hood; KALANDRAKA). This was followed by the illustrated books Garbancito, Elefante y guisante (Little Pea, Elephant and Pea), Aquiles el puntito (Achilles the Dot) and, with FACTORIA K, Arturo and La Guía Necsia (Arturo and The Necsia Guide).